NEW YORK (CNNMoney.com) -- Nearly two years since the arrest of Ponzi schemer Bernard Madoff, hundreds of his victims are in for another nasty blow. Irving Picard, the court-appointed trustee in charge of recovering and distributing Madoff's assets, has filed a slew of lawsuits in U.S. Bankruptcy Court in Manhattan over the past week -- against some of Madoff's victims. He accuses hundreds of defendants of profiting off the biggest Ponzi scheme in history by withdrawing more money from Madoff's fund than they invested, money they presumably thought was investment income. "You've got people who've done nothing wrong who took out the money they thought was theirs, and now you've got the trustee saying that money needs go to the victims," said Ilene Kent, coordinator of a victims' group called the Network for Investor Action and Protection. Kent, whose parents are among the former Madoff investors sued by the trustee, said that Picard has sued more than 388 investors so far. "This is an awful, awful travesty to the victims of this crime," she said. In recent weeks Picard has unleashed a flood of suits in an effort to recover the victims' money. In addition to multi-billion dollar lawsuits against the financial firms UBS (UBS), JPMorgan (JPM, Fortune 500) and HSBC (HBC) for allegedly aiding Madoff, Picard is also suing Madoff's family and employees. Regarding the suits against Madoff's victims, the trustee's spokesman, Kevin McCue, released a statement saying that the lawsuits are being filed "against a number of parties who withdrew more than they deposited with Bernard L. Madoff Investment Securities," the firm that Madoff used as a front for his Ponzi scheme. The defendants include Thomas Lee of the California-based firm Blue Star Investors, accused in the trustee's complaint of being "a beneficiary of this Ponzi scheme." The complaint says that the defendant received nearly $52 million from Madoff's firm -- nearly $20 million more than he put in. A phone message to Blue Star was not returned. But Kent said that many of the investors are of relatively modest means, with no ill intent. "The trustee has portrayed himself as a Robin Hood, taking for the rich and giving to the poor," she said. "But in reality he's suing innocent investors. And victims have told me, 'Let him sue me, you can't get blood from a stone.' These are people who have lost everything and are worried about whether they're going to lose their homes." McCue said the trustee is required by law "to pursue avoidance actions to recover customer property, [but[ he has discretion in these matters and will not pursue avoidance actions against customers with known hardships." McCue said that investors can apply for the trustee's "hardship program," and "if hardship status is granted, avoidance action lawsuits will be withdrawn." Madoff, 72, was arrested on Dec. 11, 2008. In March the following year, he pleaded guilty to orchestrating the most massive, long-running Ponzi scheme in history and was sentenced to 150 years in federal prison. 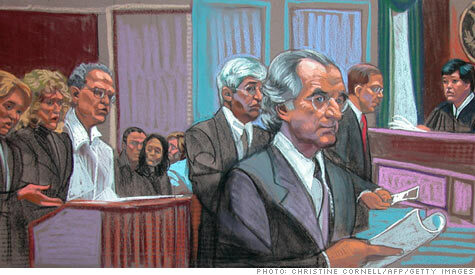 He is incarcerated at a medium security facility in Butner, N.C.
Madoff operated his scheme in the classic Ponzi style. Masquerading as an investment firm, he would accept money from investors and then steal it instead of investing it. Mature investors would sometimes cash out, and Madoff would pay them funds he received from fresh victims, instead of paying back legitimate returns. The trustee refers to these pay-outs as "fictitious profits." Attorney Barry Lax said his firm, Lax and Neville, represents about 100 Madoff victims, including a dozen who are being sued by the trustee. "What Picard is doing is really unconscionable," said Lax. "There's no allegation in the complaint that any of these victims knew anything about the Ponzi scheme, anything about the fraud." "We're talking innocent victims who lost their homes," he said. "It's a crazy insult to injury." Not everyone agrees. Michael Clark, a former federal prosecutor who pursued Ponzi schemes in Texas, said the actions of the trustee are warranted, considering the massive scale of Madoff's scheme. "I think he's acting in good faith and being aggressive because I think that the magnitude of the situation demands a certain degree of aggressive action," said Clark, chair of the securities fraud subcommittee at the defense attorney organization DRI. Referring to the victims, he said, "I can feel some empathy for these people, but I don't think [that] should be a basis, necessarily, for not being sued."